Piech, left, clashed with his cousin Wolfgang Porsche, right, last month. 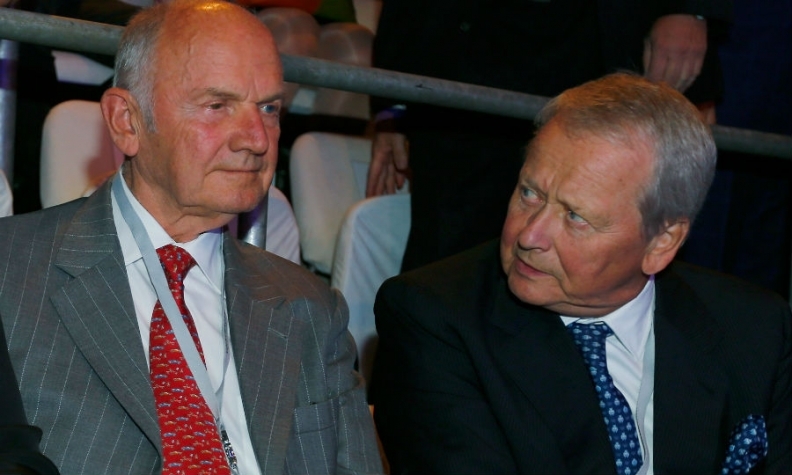 STUTTGART -- Ferdinand Piech avoided showdown with his cousin Wolfgang Porsche by not attending the annual shareholders meeting of his family's holding company that controls a majority stake in Volkswagen Group. Piech quit as VW chairman last month after losing a power struggle with CEO Martin Winterkorn, who was backed by Wolfgang Porsche and other key VW power players. Piech, 78, owns about 13 percent of Porsche SE, which controls the Porsche-Piech clan's 50.7 percent holding of VW common stock. The Porsche and Piech families today pledged to maintain their engagement in VW. "I can assure you that we will also in future live up to our responsibility toward VW and its 600,000 workers," Wolfgang Porsche told reporters here. Asked whether that also applied to Piech, whose departure has raised a host of questions about the future shape of VW, Porsche said: "Probably yes." Sources close to the matter say Piech threatened to sell his share of the family holding during the showdown with Winterkorn. Winterkorn told reporters today that he was not surprised Piech didn't attend the meeting of more than 4,000 shareholders in Stuttgart, where VW-owned sports-car maker Porsche AG is based. Wolfgang Porsche, 72, is chairman of the Porsche SE supervisory board. Winterkorn is CEO of Porsche SE in addition to his role as VW chief.